BERLIN in 3D, Virtual Worlds and Web 3D News: Social Sculpture 2.0: "Every Avatar is an Artist"
Social Sculpture 2.0: "Every Avatar is an Artist"
As part of the group exhibition "The World as Stage", Neue Berliner Kunstverein, Jan Northoff has created the 3D art installation "Every Avatar is an Artist", which can be seen in real and Second Life. Taking point of departure in a reverent Beuys quotation and showing how it can be actualized today in regards to the opportunities of virtual reality, this project brings collective consciousness to a new state. Joseph Beuys said: "Every Human Being is an Artist". This statement is now translated into the virtual World. The chat robot and virtual representative "Beuys2.com" is not a replica of the physical Joseph Beuys, but a contemporary result of responses to his own statement above. 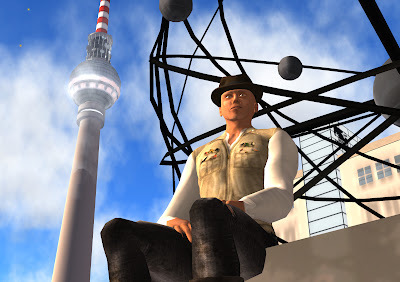 "BeuYs2.com’s ‘brain’ is a database that is constantly updated via live feeds from all the tweets (posts) pertaining to Joseph Beuys on Twitter and from Avatars in Second Life. These information feeds gather both factual and misleading information, forming a true ‘collective consciousness’. The web 2.0 development is the Internet revolution of user created and user involved social platforms and networks, changing the real life word increasingly. The Beuys2.com bot implements an upgrade and manifestation of the collective memory of Joseph Beuys. "The Wolrd as Stage " is curated by Solvej Helweg Ovesen. Opening hours: 21.11.09-10.01.10, Tuesday through Sonday 12-6 PM, though Thursday 12-8 PM, Chausseestrasse 128/129. Closed 24.12.09-2.1.10.
Review on "Every Avatar is an Artist"
Welcome to the BERLINin3D-Blog! newBERLIN, the true to scale version of Berlin in Second Life®.This blog is a selection from interesting Stuff around Second Life®, 3D Internet, Web 3D, Web 3.0,Mixed Reality, newBERLIN, YOUin3D.com, CAMPUSin3D.com, BIZZin3D.com and Virtual Worlds in general. Impressum & Datenschutz (YOUin3D.com GmbH) . Powered by Blogger.